Comprehensively hair removal, hair pops up from cheeks, chin, forehead, upper lip, arms, legs...even fingers and toes. The most advanced easy to use hair threading system. We are THE ONLY GENUINE SELLER WITH LIFETIME WARRANTY. Using the hottest trend in salon/spa hair removal, "Hair Threading", Is is a new innovative device that can give women that perfect hair free skin model look easily from the comfort of their own home. "Hair Threading" a time proven technique passed from one generation to the next, is now available in a modern small and attractively priced device. It is a device that "holds" the thread exactly like the professional,enabling you to preform a threading hair removal on your own. 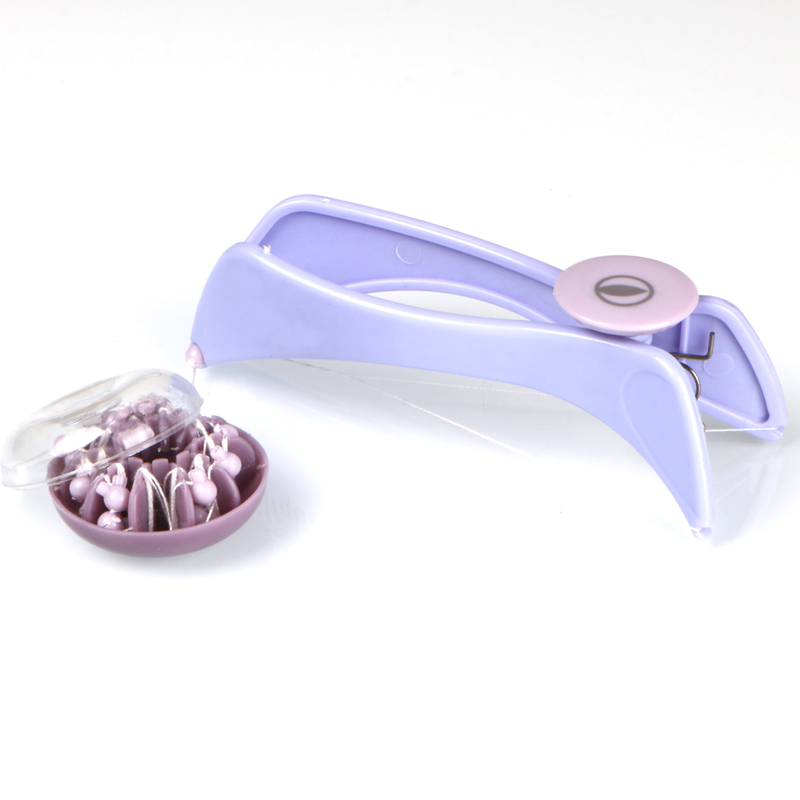 Single Handed, as you press its handles, you can see the looped thread move as the applicator handle opens. Unlike tweaking one hair at a time, it's efficiently removes an entire straight line of hairs, all at the same time...leaving the skin hair free and smooth. Even baby-fine, hard to see hair and coarse, heavy hair! It was invented so that women all over the world could perform threading at home without the need of a salon. It's easy and safe to use,once you've tried it you will never want to use any other hair removal method. Now please take your time and use at home,just so easy. 1, Eyebrow Face and Body Hair Threading and Removal System. Amazing at home quick and painless hair removal system using the ancient technique of Threading to remove ALL unwanted Hair. 2,With this product, you can enjoy the threading experience and have the confidence of knowing that your skin is hair-free, silky and smooth. 3,Removing facial hair from the roots without damaging the skin like waxing or bleaching does. 4,No more messing with creams, depilatories, waxes, bleaches or shavers. Easy to clean. 5,Suitable for removing hairs on forehead, cheeks, and chin and arm. 6,Portable item, you can use at home or at travel.